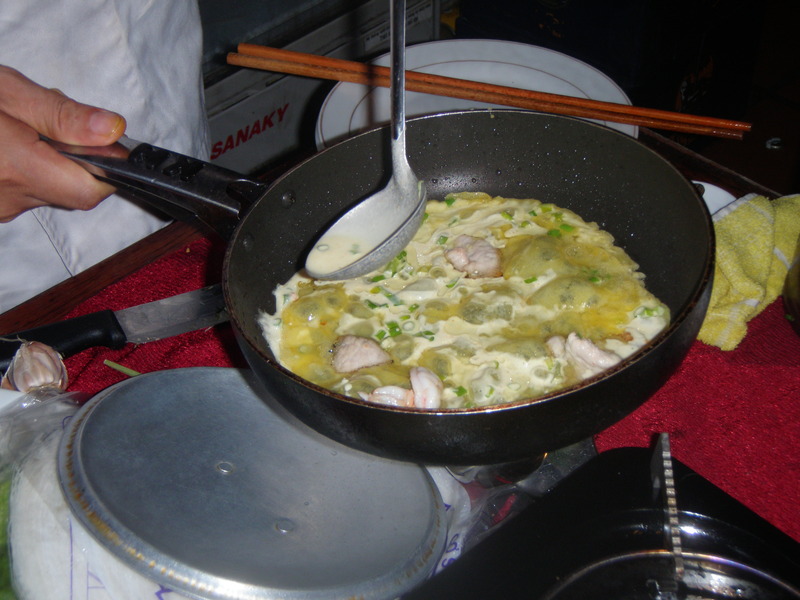 Choosing a Cookery Class in Hoi An, Vietnam – Why Waste Annual Leave? Cookery classes are to Hoi An what Starbucks branches (unfortunately) are to London i.e. one on every corner. Essentially, almost every restaurant you walk past advertises their own, which can make it a bit of a minefield when it comes to selecting one. Pumpkin had done something similar many years ago in both China and Cambodia (I’m still at a loss to explain why Pumpkin isn’t the one writing the blog) so was fairly laid back about the decision. Actually – he’s fairly laid back about every decision in life. Mum (a long standing fantabulous chef and in my biased opinion, one of the best Indian chefs in the world) and Dad decided to sit this one out but for sibling and myself, this was to be a highlight of our trip so why on earth were we wandering around Hoi An on our penultimate night still looking for a class?! Well renowned classes versus lesser known classes – the better established companies may have a good reputation preceding them with well-equipped kitchens and ample working space but the smaller ones are perhaps more authentic and less touristy. Group size – classes can vary from groups of 20 to private classes for 2 so think about which kind of cooking environment you would thrive on and learn best from. Pumpkin will risk my wrath to verify that as delicious as my home baking may be (sorry to toot my own trumpet but I make a mean cupcake), I am not known for my savoury dishes! For me, therefore, smaller classes with more one to one guidance from the chef was definitely a necessity! Budget – the classes we explored varied greatly in price from 15 USD – 40 USD per person for 2 hour classes. Organisational skills – some of the better known classes, particularly those featured heavily in Lonely Planet, Trip Advisor etc often book up well in advance and would usually need at least several days notice. Smaller classes can often be booked within 24 hours of the scheduled class time. Menu – most classes have choices of set menus – worthwhile contacting or heading down to the class of your choice in advance to check this against your preferences or dietary needs. Time of day and attached market trip – many of the classes offer 8.30-9am guided trips to local food markets to learn about and purchase fresh ingredients before budding chefs-in-the-making proceed to preparing a full blown Vietnamese meal. This may involve forfeiting your free hotel breakfast or might not appeal if you’re not keen on squid salads for brunch! Other classes run later in the day and may suit those who want the cookery experience without the market trip or who want it to coincide with dinner. Many of the classes held later in the day do offer the market trip but the true experience involves getting there early in the morning. After much deliberation (and if I’m honest, much inefficiency on my part), we took a bit of a gamble and opted for a very reasonably priced 4pm – 6pm class at the Viet Vic Cookery School on our final day in this gastronomic nation….and it really was a gamble. It is so authentic and understated in fact that I’m unable provide you with any links to this local riverside find. When we first entered and enquired about the class, we were met with almost surprise. We struggled a bit with the communication when trying to discuss menus and then witnessed an adorable toddler running around the restaurant with a cardboard box on his head, being chased by his elderly but royally unimpressed Grandma…..Clearly, we had walked into a family-run restaurant, encompassed within a family home and with a slight sense of trepidation (and the knowledge that it was now or never), we parted with our dollars and hoped for the best. Fortunately for us, this leap of faith paid off hugely. The chef, another member of the family, met us the next day and other than the 3 of us, we were accompanied by just one couple. The class was carried out on one of the restaurant tables and with the use of a portable stove. With such a small group, we made everything from scratch, had a combined menu featuring 5 dishes and were in close proximity to the chef throughout the class to witness his techniques. 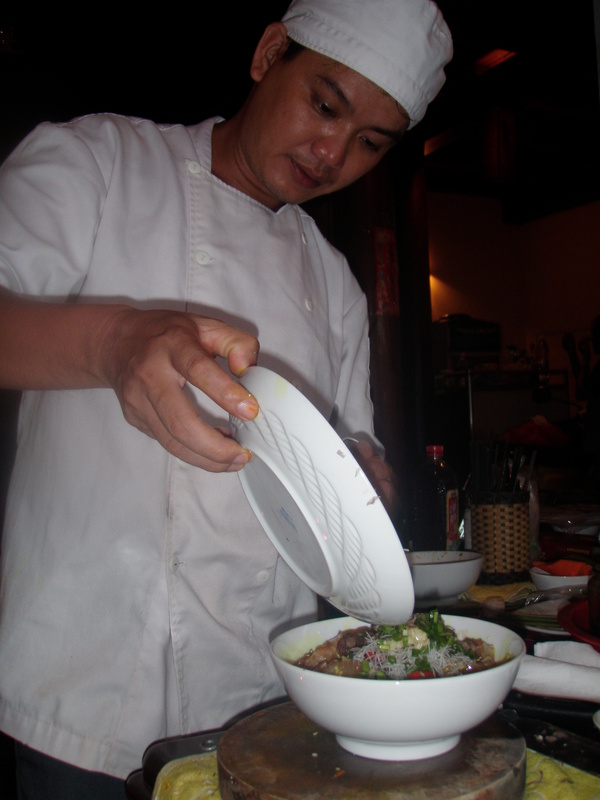 He taught us a lot, not just about recipes but also about knife skills, local ingredients and Vietnamese culture. He also told us most Vietnamese men grow up being taught how to cook! An interesting contrast to many other Asian cultures I’ve been exposed to. As a doctor, it is almost a rite of passage to have illegible handwriting so I was immediately excused from recipe scribbling duties. I achieved two personal firsts on this class – (1) de-veining prawns for the first time (2) eating squid for the first time – both of which I’d been reluctant to do for many years and now feel happy to do. The 2 hour class ended up being nearly 3 hours long including the gourmet dinner that we all ate together at the end, including our own handmade squid salad, Vietnamese spring rolls, fish wrapped in banana leaf, Hoi An Won Tons and rice pancakes. It doesn’t get much better on holiday than fine, handmade, authentic food and stimulating conversation with fellow travellers in an intimate setting, made all the more rewarding with the knowledge that we cooked it ourselves! The chef did gave us the option to visit the food market but correctly pointed out that the early morning is really the time to explore the market so the group decided to stay put, although he kindly offered to take us the following morning at no additional charge. We would have happily taken up his offer had it not been for the journey back to reality scheduled for the next morning. The kind of class you prefer is an entirely individual decision but if you are more inclined to something smaller, more hands-on and truly authentic, try out this small family-run business – extremely good value for money and a thoroughly enjoyable 3 hours. Thanks for commenting Nita! 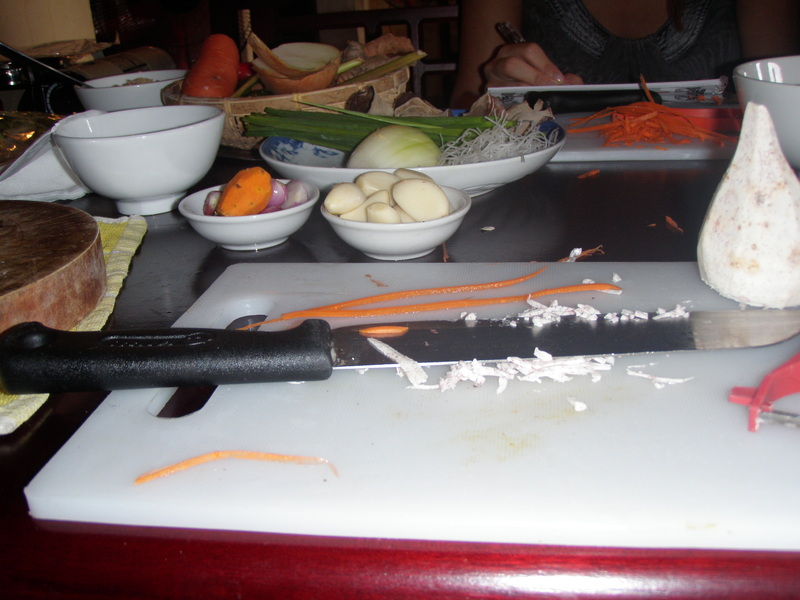 Yes it was great fun – I’d never done a cookery class on holiday before and had never made Vietnamese food at home so it was really useful as well as delicious! Awesome! You know I have always wanted to do a cooking class while on travel. Vietnamese food sounds like a good one to do. Perhaps when I’m in Vietnam! great post about classes….wish we got to do one in Hoi An….what a cool city right? 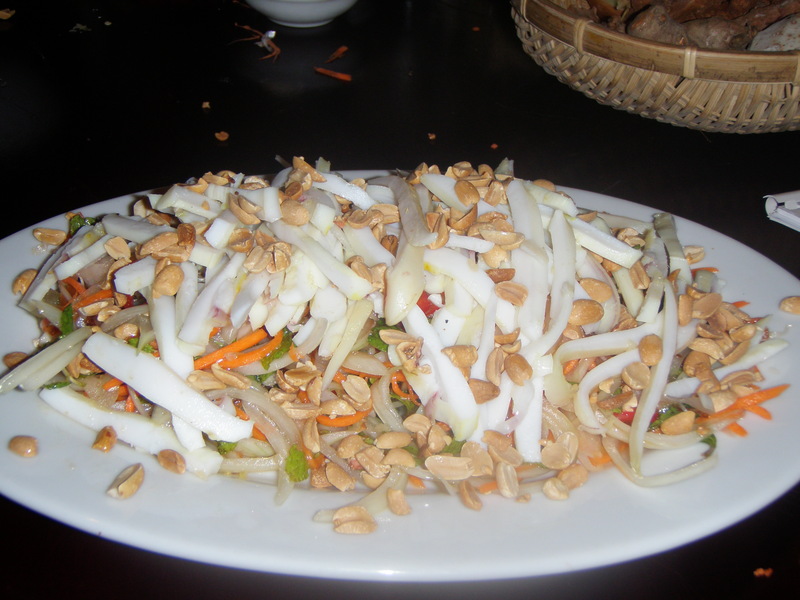 Thanks so much for the comment – the class was great fun especially as I’d never cooked Vietnamese food before. Hoi An really is a charming city – the people are all so warm and friendly and it’s got so much character and culture with such a laid back pace of life! Lovely post! 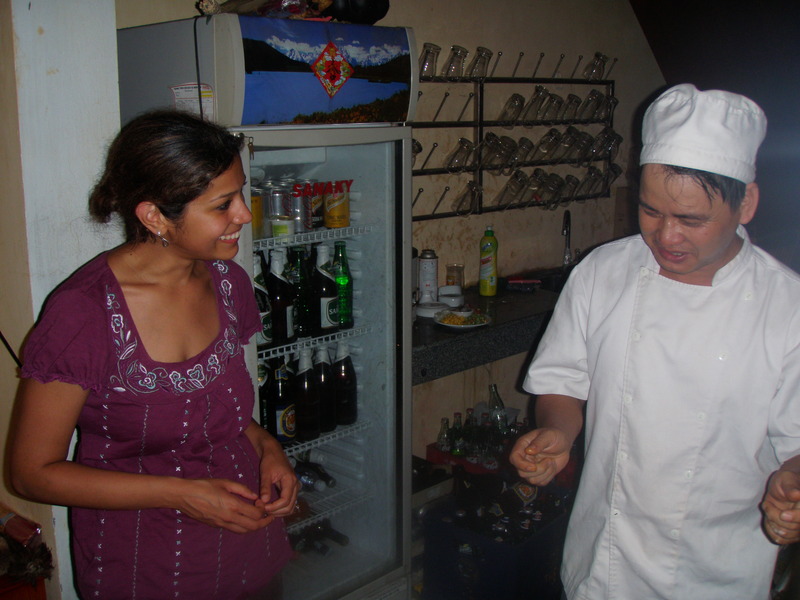 I have never actually taken a cooking class on my travels… maybe it’s high time I did. The food looks amazing! Thank you for the kind comment! I can’t say I’m known for being a great chef so it was useful to get some small group supervision!! And it was nice to branch out a bit and use completely new ingredients and spices! I’d definitely recommend trying a class abroad if you get a chance and please share your story if you do! Happy travels! This seems like it would be a great thing to do while traveling! I’m like you – I spend a decent amount of time in the kitchen, and I consider myself an above average baker, but I never seemed to grasp the cooking side of things. Possibly because baking starts with nice, simple things like eggs and butter, and cooking involves things like de-veining shrimp. (I’ve never managed that on my own either.) I love that the chef offered to take you to the market! We did a cooking class with Tra Que Water Wheel. It was amazing and oh-so-delicious! Oh yes, I’ve heard great things about that cookery school too! What kinds of things did you cook? Vietnamese food really is one of my favourite international cuisines! 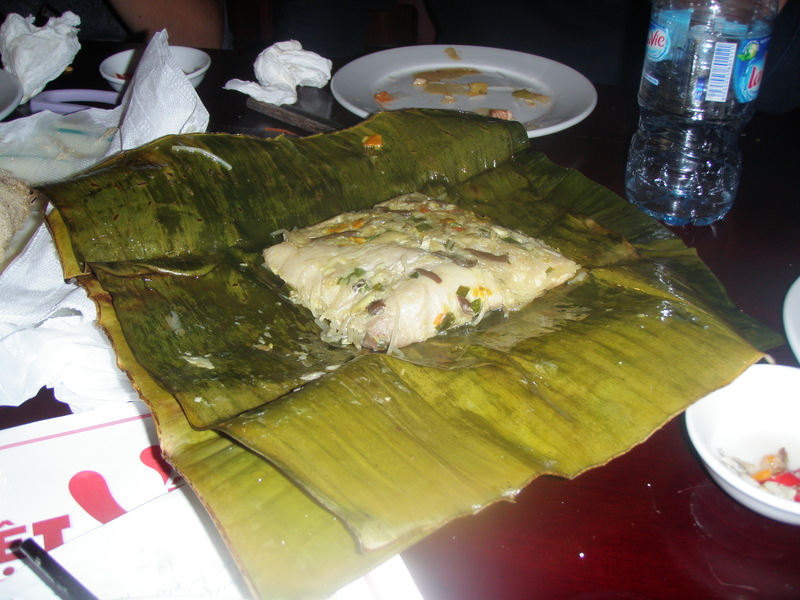 We made green papaya salad, banh xeo, 3 sisters spring rolls, fish in banana leaves and a few other dishes. I love Vietnamese food. It really is one of my favorite cuisines too! This looks like it really would be fun – and what an experience! Thanks for commenting Emma 🙂 It really was good fun! If I get a chance, I’d definitely do a cookery class in South East Asia again like Thailand or Cambodia etc! Plus it helped me improved my rather basic cookery skills! Looks like so much fun! Is it easy to find classes taught in English? Or French? Thanks for commenting Linda 🙂 It really was great fun – I’d definitely recommend it – really easy to find classes in English – there are so many different cookery classes around and most of them do classes in English like the one we did. I never asked about exclusive French classes but being Vietnam, I’m sure there would be! It really is a charming little place! The food was indeed delicious…though I can assure you it wouldn’t have looked nearly as tempting had it not been for the chef supervising me!! Looks very tasty and a great experience! Hi, my partner and I are currently in Hoi An and are wanting to do a cookery class. I stumbled upon your blog and your experience sounds amazing and everything we are looking for! Could you give us any more information on where to find Viet Vic as we are very keen to get cooking! Pingback: Made to measure clothes, Hanging Lanterns & Unspoilt Beaches in Hoi An, Vietnam | Why Waste Annual Leave? That’s great to hear David! 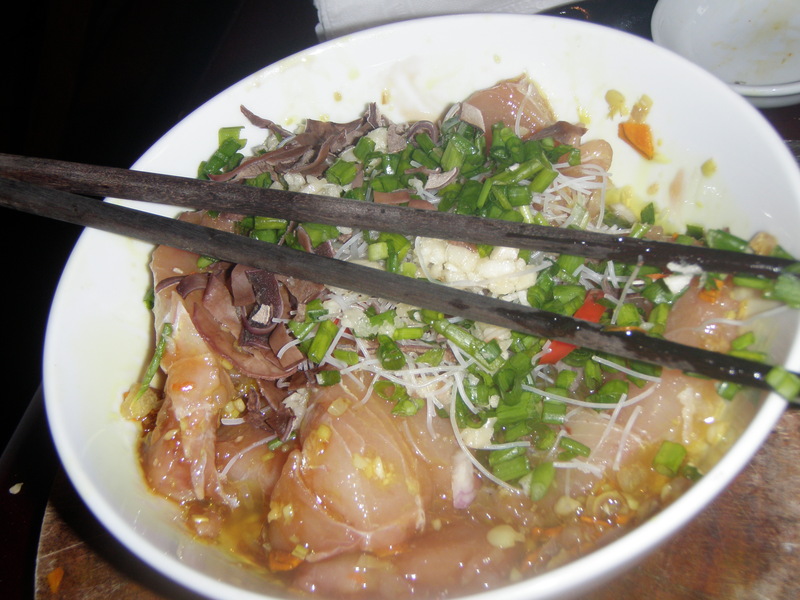 I’m delighted to hear that you also went to Viet Vic and enjoyed it as much as I did. There are so many big and famous cookery schools out there, as I’m sure you’ve seen yourself so I loved how intimate and cosy this place was with fantastic recipes and as you say, a wonderful chef! 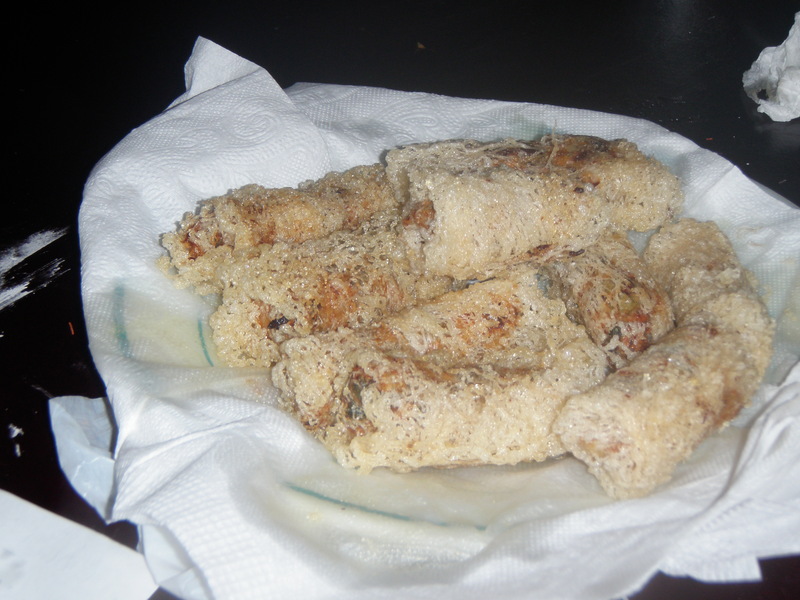 The banana wrapped mackerel and spring rolls sounds amazing and I only wish I could reproduce those just as well in my kitchen at home these days 🙂 Thanks so much for reading! Thanks so much David for the kind words – made my day & very grateful for the support ☺ sounds like you have tasted some delicious foods out there! I remember reading about a couple of food tours but didn’t get round to doing them but I kind of regret that now, as it does sound like a great way to explore the foodie scene of the place! Pingback: A Balinese Cooking Class in Ubud at The Payuk Bali Cookery School | Why Waste Annual Leave? Pingback: A Spanish Tapas Cooking Class at Jenius Social, London | Why Waste Annual Leave?